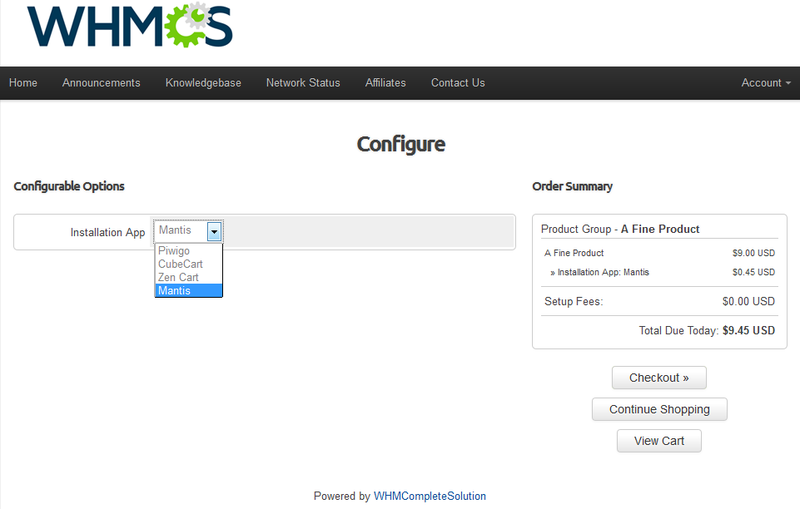 ModulesGarden cPanel Extended for WHMCS now supports Softaculous. ModulesGarden cPanel Extended for WHMCS is a fully featured addon module created in order to facilitate management of cPanel. ModulesGarden allows your customers to manage their hosting accounts without even accessing cPanel! Whole cPanel's functionality with Softaculous Application Installer, Backups Management and Auto Installer is relocated directly to the clientarea. This is a fantastic time saving and convenient! Softaculous Application Installer where you can easily install your favourite applications within a few seconds! Softaculous Auto Installer due to which you can offer your customers cPanel accounts with already installed application! ModulesGarden would like to offer all Softaculous customers a special discount for cPanel Extended For WHMCS! Check out our new 1.6.4 version with ability to assign configurable options to application autoinstall and stay tuned for more info! It was a very hard-working but fruitful year for ModulesGarden. We hope that this was also a good year for you. Due to the upcoming Christmas we prepared for you a 20% Christmas Promotional Code for EACH of our products. This of course applies to the cPanel Extended For WHMCS With Softaculous. Code will be active until 06.01.2013! We hope that your servers will handle a huge overloads from thousands of new clients in the next year! We are happy to announce the release of cPanel Extended For WHMCS V2.0.1 with improved support for Softaculous and many new features. What's new since version 1.6.4? If you would like to test our module for free, click here! If you will decide to get a lifetime valid module license, you can pay less because specially for all the Softaculous customers, we prepared a 25% discount! This promotion combines with other promotions! For more information about cPanel Extended For WHMCS visit our website or Wiki. Is this promotion still valid? Yes the promotion is still valid. 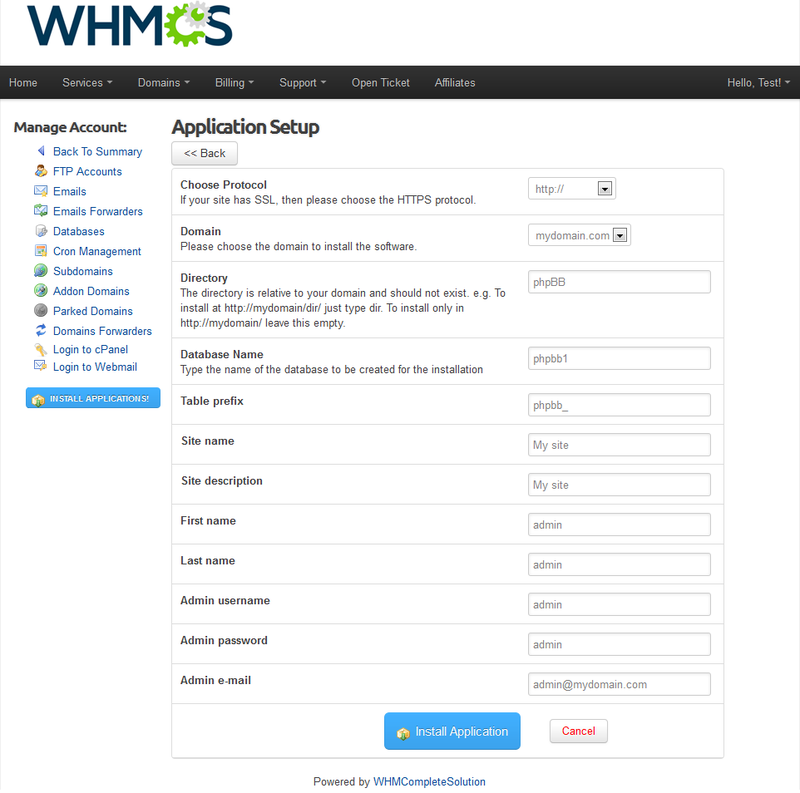 ModulesGarden has just released cPanel Extended For WHMCS 2.2 with improved Softaculous Application Installer! installations of the applications in a simple and easy way. You will be able to save the file with all available applications, decide which version of certain application will be available for your clients or which version will automatically install along with creation of cPanel account. If you use WHMCS + cPanel, this is a solution you are looking for! Hundreds of licenses sold only confirms the efficiency of the module. If you want to improve your customers experience with Softaculous, cPanel Extended For WHMCS is the right choice. Would you like to order the module? Why not to pay less? It is a great pleasure to announce that cPanel Extended For WHMCS with Softaculous support, not only has undergone a total makeover but is also compatible with WHMCS V6.0! In version 2.6 the module has been thoroughly refreshed in order to deliver the ultimate in business management. The update comes with plenty of new features and improvements which combined with a brand-new user interface make the module the state-of-the-art solution on the market. Discover the fresh appearance and learn more about new attributes! For more information about cPanel Extended For WHMCS visit our website. Do not forget about our special promotion! We have a 25% discount for all Softaculous clients! All you need to do is apply the promo code: MG_Softaculous to your order on our website. We are thrilled to bits to inform you that the most monumental update in the history of cPanel Extended For WHMCS, still in perfect harmony with Softaculous, has just marched into our Marketplace! 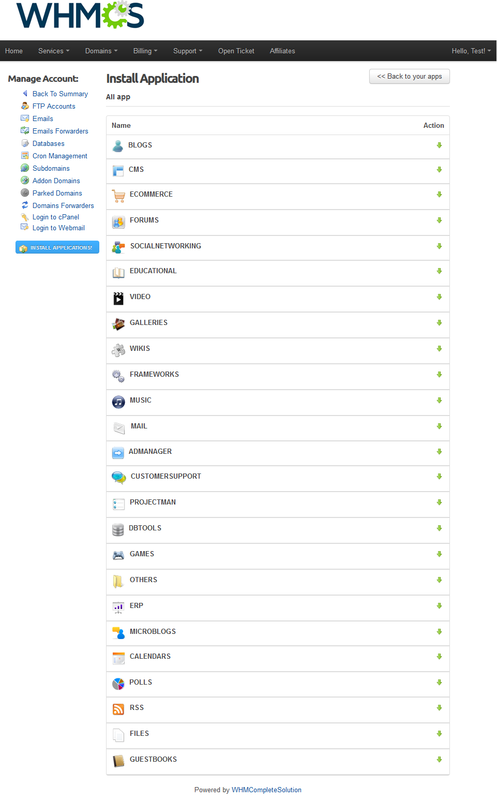 Ladies and gentlemen, presenting to you the newest, space-age cPanel Extended For WHMCS 3.2.0! Feel the instant flow of freshness triggered by a smart code subjected to out-and-out reorganization, and an excellent novel framework bringing out the best in our software. 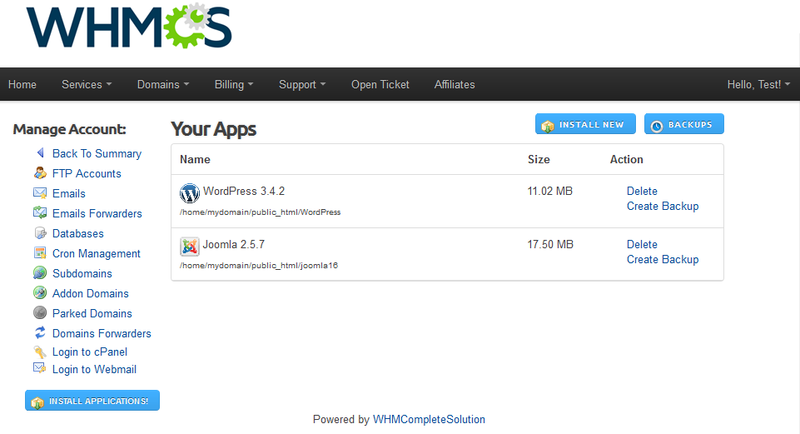 If you are keen to look deeper beneath the surface, you will immediately spot such elements as steadfast support for WHMCS V7.5 and WordPress For WHMCS module. Eager to learn more thrilling facts about cPanel Extended For WHMCS? Or even use the module for a week at zero cost? Click here! Taking the opportunity of this milestone release, we have arranged a special 25% discount for all Softaculous supporters! Simply apply the promo code: MG_Softaculous while placing the order on our website. Enjoy! Just letting you know about our newest cPanel Extended For WHMCS 3.3.0 which is marked by impeccable compatibility with WHMCS V7.6. Apart from the long-awaited support for 'Auto Update Backups' option for applications installed through Softaculous, the update implements a couple of other entirely new features as well and enhances a no less extensive range of some of the existing functionalities. It is also a sheer pleasure to inform you that the module can be now snapped up from ModulesGarden Marketplace at a 10% lower price thanks to our special Deal Of The Week offer. Do not let anyone beat you to this extraordinary opportunity. Check out cPanel Extended For WHMCS 3.3.0 now! 1. We are tremendously proud to announce that cPanel Extended For WHMCS, our absolutely bestselling module dedicated to all aspiring web hosting providers has just got even better. The most essential addition to the newest 3.5.0 version that your clients will promptly and eagerly discover is the support for application cloning and staging that will let them create a copy of any application installed via Softaculous, and push the staging application to live whenever ready. Moreover, what has been greatly facilitated for your audience is the management of connected email accounts. Not only will they now be able to access all essential details of their email accounts with just a single click but set a new password for existing mailing lists from the client area directly as well when needed. Finally, they have been enabled to access the previously generated CSR key by simply navigating to the "SSL/TLS Management" section. While this is no doubt a good amount of novelties to pick and choose from, still more await your attention on our website. Learn more about cPanel Extended For WHMCS 3.5.0!